The Antarctic ice sheet holds about 90 percent of Earth's frozen store of freshwater. Its dynamics, particularly melting rates, have many implications for climate change, from determining sea level rise to influencing ocean circulation patterns. Now, scientists Eric Rignot from the Jet Propulsion Laboratory and Stanley Jacobs from Lamont-Doherty Earth Observatory reveal in the June 14 issue of Science that the bottoms of Antarctic ice shelves are melting much more rapidly at their grounding lines than previously thought. National Science Foundation research vessel Nathaniel B Palmer near the Mertz Glacier Tongue in January, 2001. The Mertz is one of the 23 ocean extensions (shelves and tongues) of the Antarctic ice sheet that Rignot and Jacobs show have rapidly melting underbellies. Photo courtesy of Stan Jacobs. "It's important because in the climate machine, which includes interactions among ice, atmosphere and oceans, the component that has been overlooked is ocean-ice interaction," says Terence Hughes, a glaciologist at the Institute of Quaternary and Climate Studies in Maine. "Using satellite data, a means that has revolutionarized the science, the authors better constrain an important and extremely vulnerable part of the climate system, the ice sheets." Ice shelves extend off the ice sheet and protrude into the ocean. 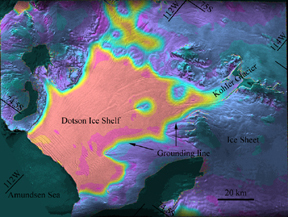 Rignot and Jacobs focus on the areas close to the grounding lines, where the ice detaches from the seafloor and begins to float. 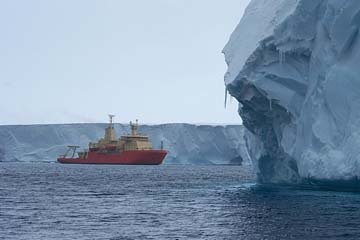 Using satellite radar interferometry, a technique that measures the change in size, velocity and shape of the ice shelves, the scientists were able to precisely locate the grounding lines of 23 shelves. Depths at which the different ice shelves detach from the seafloor vary. The ocean water is 2 to 3 degrees above freezing and, due to its saline composition, is able to melt the ice. At depth, increasing pressure causes greater melting. Rignot and Jacobs note overall high basal melt rates, from less than 4 meters per year for shallower grounding lines to greater than 40 meters per year at deeper grounding lines. Image of tidal motion of Dotson Ice Shelf, Antarctica, obtained from interferometric synthetic-aperture radar data collected by the European Remote Sensing Satellite ERS-1 in 1992. Grounded ice is colored blue, floating ice is colored red, the transition from grounded to floating ice is colored blue, to light green, to yellow and red as the ice adjusts to hydrostatic equilibrium. Bottom melting is calculated in the proximity of that transition region. Image size is 100 km x 100 km. Image supplied by Eric Rignot. Although the authors suggest that presently the melt rates maintain the equilibrium of the Antarctic ice sheet, they estimate that increased ocean temperatures will lead to enhanced melt rates: a meter per year for a 0.1 degree Celcius temperature increase. "A change of 0.1 degree Celcius is not unrealistic, and a meter per year thinning of ice is a large rate. In a hundred years an ice shelf can disappear. Computer models suggest that an effective way to make an ice sheet disappear is to melt its ice shelves," Rignot says. Much of the seafloor around Antarctica actually deepens toward the shore as the weight of thicker ice presses it down. Thus, additional bottom melting would cause deeper grounding lines and this in turn would exacerbate the melting process. "This research does change the way we consider the Antarctic ice sheet. We are getting at the underlying mechanism that causes ice sheets to melt and we see that this melting is happening very quickly," Hughes says.